"Mrs. Marcia Forbes, Community Relations Officer at Jamalco presenting a cheque to Dr. Patrick Knight, Senior Medical Officer at Spanish Town Hospital recently. The cheque represents half of the cost of an electrocardiogram machine which has been donated to the hospital by members of the Southern Branch of the Medical association of Jamaica and Jamalco. Centre is Mr. H. V. Linton, acting Administrator of the hospital." 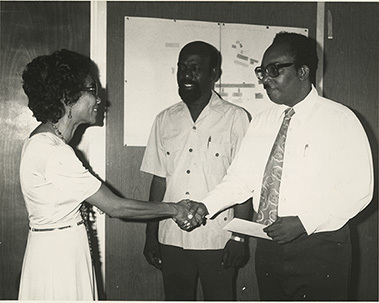 Daily News, “Spanish Town Hospital - gift,” National Library of Jamaica Digital Collection , accessed April 20, 2019, https://nljdigital.nlj.gov.jm/items/show/5281.